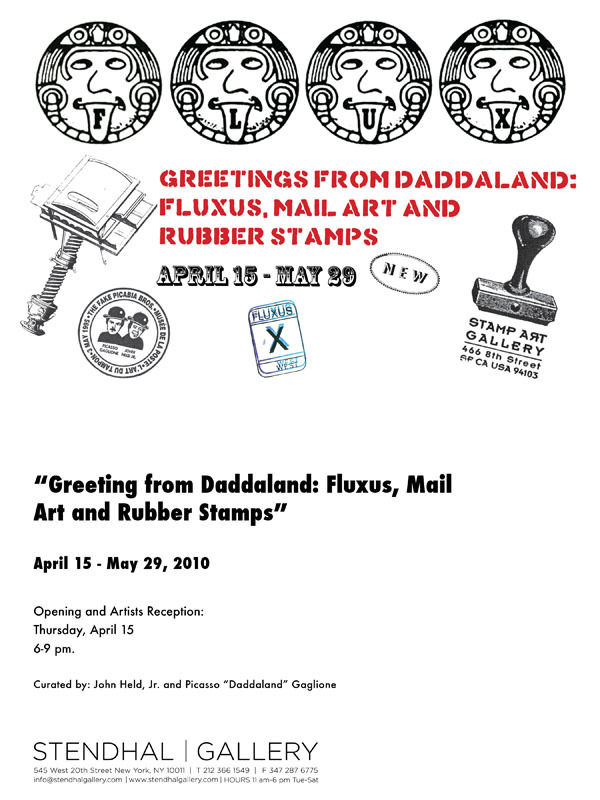 Stendhal Gallery will present the exhibition, “Greetings from Daddaland: Fluxus, Mail Art and Rubber Stamps,” opening April 15 through May 25. The exhibition is drawn from the collections of John Held, Jr. of San Francisco and Picasso (Daddaland) Gaglione of Chicago, collectively known as The Fake Picabia Brothers. The present Stendhal Gallery exhibition continues the exploration of avant-garde art Gaglione and Held began tracing together in the 1970s. Gaglione and Held presented a showcase for Fluxus, Mail Art and rubber stamp art at The Stamp Art Gallery in San Francisco during the mid-1990s. The current exhibition documents the gallery’s activities through posters, exhibition catalogs, performance documentation, mail art, artist postage stamps, rubber stamp box sets made to commemorate the various exhibitions and excerpts from past Stamp art Gallery exhibitions. Coupling his passion for collecting sets of antique rubber stamps (dating from the 1920s), and his penchant for Fluxus inspired works, Gaglione began creating rubber stamp box sets to accompany exhibitions by contemporary artists and to honor historic figures of the 20th Century avant-garde, who had influenced his artistic practice. In putting together the rubber stamp box sets, Gaglione and Held followed the example of Fluxus impresario George Maciunas in his production of Flux-Kits. These inexpensive yet elegant multiple editions set the tone for the production of these post-Fluxus editions. In the production of the rubber stamp boxed sets and gallery exhibitions, Gaglione and Held, worked closely with noted art historians. Their exploration of Yves Klein’s “Blue Stamp,” created and mailed for a 1957 gallery exhibition, brought them into contact with the late Pierre Restany, the French critic who formulated Nouveau Realism. Their work on the history of French/American artist Arman, lead Held to the artist’s studio in New York City, where he not only was interviewed, but created original drawings to be made into rubber stamps. By the time the Stamp Art Gallery closed in late 1997, Fluxus related rubber stamp box sets produced included “George Maciunas: Passport Photographs by Peter Moore” (1996), “Belgium Fluxus by Luce Fierens” (1996), “Jeff Berner: Self Portrait Stamps” (1997), “Fluxus Commemorative” (1995), “Ken Friedman: Faux Fluxus West Edition” (1995), “Geoffrey Hendricks: Cloudsmith” (1997), “Geoffrey Hendricks: Identification Kit” (1997), “Alison Knowles: St(r)ing Piece” (1996), “Takako Saito: Enjoy Your Life” (1997), “Mieko Shiomi: Endless Music” (1997). In addition to Gaglione and Held’s interest in Fluxus, other box sets mark their interest in Dada (Bay Area Dadaists, Marcel Duchamp, Raoul Hausmann), Russian Futurism and Constructivism (Zaum, Tatlin), Kurt Schwitters, Nouveau Realism (Klein, Arman, Tinguely), Conceptual Art (Dieter Roth, Tom Marioni) and Mail Art (Ray Johnson, buZ blurr, Ruud Janssen, Richard Craven, Ulises Carrion, Guglielmo Achille Cavellini, Robin Crozier, Ed Plunkett, Endre Tot and May Wilson). Stendahl Gallery exhibition will recreate some of the more notable shows Gaglione and Held presented in the past, including the exhibition of Dutch artist, Ruud Janssen’s, Rubber Stamp Archive, which includes rubber stamp impressions by Fluxus artists. Janssen will lecture at Stendhal Gallery with curator John Held, Jr.
Other artists shown in the exhibition include New York Correspondance School artists Ray Johnson and May Wilson; Arman’s drawings produced for the Stamp Art Gallery to be made into rubber stamps; postage stamp artist buZ blurr; a series of crop circle rubber stamps by Robert Rocola and rubber stamps depicting pioneers of 20th Century avant-garde art by M. B. Corbett. Several films will be shown during he exhibition, including a 1977 interview with Ray Johnson by curator John Held Jr., performances by The Fake Picabia Bros and documentaries on Mail Art. A complete collection of over fifty Stamp Art Gallery catalogs were previously acquired by the Museum of Modern Art Library, New York. Held has also compiled collections for the Getty Museum and the Archives of American Art, Smithsonian Institution, Washington D.C. The works on display are drawn from his personal collection with new rubber stamp works produced by Gaglione, now living and working in Chicago under the rubric of Stampland. Saturday, April 17th, 1 p.m. Performers are : Picasso Gaglione, Darlene Domel, Keith Buchholz, Reed Altemus, Melissa McCarthy, Ruud Janssen, Christine Tarantino, Marlene Weisman-Abadi, and Mark Bloch . This exhibition has been produced and organized by Harry Stendhal and partially funded by George Maciunas Foundation Inc.
hope the show is a big success–wish we could be there to see it! It’s about time that you got a nice place to hang your hat and art.